Home Sports & Outdoors Learn How to Set up a Fishing Pole: 8 Simple Steps! Fishing is a joy to many people and it can be as complicated or as simple as you like. It’s up to you how you choose to engage in the sport. One thing is for certain, however, you’ll need to know how to set up a fishing pole. Some people can fish with spears or their bare hands, and of course, there’s the fishing net. But the vast majority of recreational fishing is done with a pole. But do you know how to set up a fishing pole? Would you know how to set up a fishing pole with a bobber? Any top-class fishing pole can be complex, so make sure you’ve got all the parts before you begin! Rod Tip: This is the end for the rod, where the line leaves the rod. Usually, with a ring, it lets the line move smoothly. Guides: These are the rings the line passes through to be guided up the pole. Reel Seat: This device rests over the rod blank at the bottom end of the rod and is where the reel attaches. 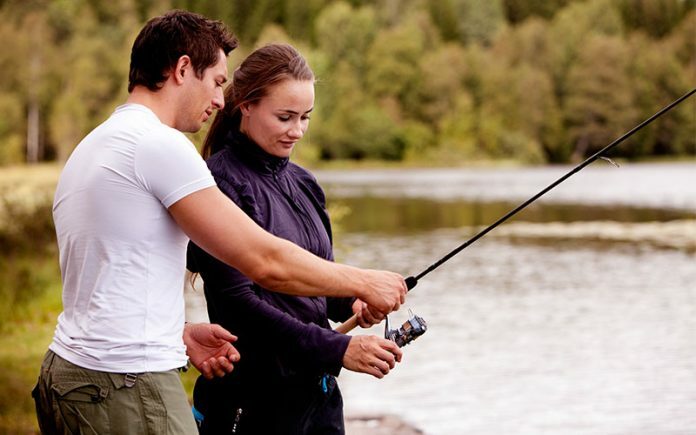 Handle: The most personal part of a fishing pole, the handle is vitally important to an enjoyable fishing experience. Made from any number of materials, it’s a totally personal choice. The reel is where the line is stored and the make, construction and design changes depending on what type of fishing you want to do. Spool: This is the storage for your line and where the line spools in and out from to travel up and down the line. Bail: Also known as a pick up, this is a length of thick wire that guides the line from rod into the spool when you’re drawing the line back in. Handle: The handle (or grip) is the part you grip and turn to crank the line in. Reel foot: This is the connection between the reel body and the fishing pole itself. Drag knob: This device sets how much resistance the fish feels on the end of the line. If set improperly will result in many broken lines. Line roller: Line roller is the surface over which your line moves on the way in or out of the reel. There’s always more kit to buy when it comes to fishing, but these are the basic essentials. Barrel Weight – A one-ounce barrel weight is a standard weight to keep your line steady and your float stationary in the water. Swivel – A swivel allows the weight and/or hook to spin freely on the end of the line. 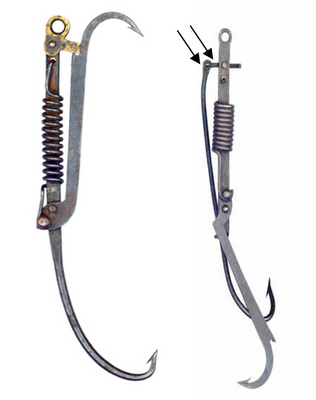 Hook – There are thousands of types of hook, each for a different type of fish and a different condition. Basically, it’s what the fish inadvertently bites on when going for the bait. Bobber– Also known as a float, the bobber is what lets the fisher know where the hook and bait are located if they can’t see the line. Clippers or scissors – Lines tangle or snag, and sometimes, a too-big fish ends up on the end of the line and you’ve got to cut out. Most fishing rods have a cutter on board but you might need some clippers or scissors if there is a tangle beyond it. Much better to have some scissors than to lose your pole. Each fishing rod is slightly different and very customizable, each fisher has his or her own preferences for handles or spools. Generally, there are a lot of common features, so we’ll take you through here. Before you start setting up a fishing pole, make sure all the parts are thoroughly cleaned and oiled if necessary. This will prevent corrosion and extend the life of your pole. First insert the reel seat onto the pole, making sure it attaches snugly. Then you’ll see the female part of the attachment, which should correspond to the male part of the reel. Connect these without forcing them. If they don’t fit together, stop and examine whether there is a blockage or dirt. They could also be incompatible, in which case you’ll need a different reel or a new reel seat. Be wary of overtightening the screw(s), if you apply too much pressure you can crack the rod. Spooling a reel can be a tricky task, but don’t worry, there’s a good way of doing it. The first tip (you don’t have to do this but it helps) is to soak your nylon monofilament line overnight in water. This softens the line and makes it much easier to spool. Don’t worry, it won’t lose any strength. Load your spool onto a pen or other object it can spin freely on, make sure the line is taut from the line source and start turning the reel. This should load your line onto the spool. Be sure to keep it under tension: some people use a towel on the line to keep it taut, others will simply stand a distance away and use their hands to keep it taut. Lift the bail arm and pull out the end of the line. Thread the line through the guides (make sure you’ve put it through all of them!) and close the bail arm. If you’re new to fishing, this is the point where it’s good to ask someone more experienced as to what the perfect lure is. There are thousands you can choose from for thousands of situations, so a little research before you go is advised. You’ll need a different lure if you’re going for trout, in saltwater or freshwater, in a lake or at sea, the time of day, how cloudy it is, it all makes for a different choice in lure. To attach your lure, you thread the line through the eyelet in the lure, leaving a good 20cm free. Without putting any tension on the line (it’s good to have the line and rod laid on the ground for this), make a loop around the line and then draw the end of the line through the loop. Repeat this a few times and then tie a fastening knot over the top by looping the line around the other end, pulling it through and pulling tight. This depends a lot on what type of pole and reel you’re using. Look at the instructions for the specific type that you have. There should be a clearly marked knob on the reel that you can turn to adjust drag. Some will click when you turn them to give you an idea of how much drag you’re putting on there, some will have a changing amount of tension. Very importantly, you need to check the breaking tension of your line. You shouldn’t be setting your drag to anything above 25% of the breaking strength of the line. This is easily worked out, it’s just the strength of the line divided by four. Get some hanging weighing scales and set up your rod for use, tying the scales to the end of the line. Hold at a 45-degree angle and pull down on the scale. When you see the line go taut, stop and take a measurement. This should tell you what your drag is, you can then adjust it to be suitable for the line and conditions. Get to know what you’re going to be fishing and then get the right bait. You won’t catch your trout if you’re using saltwater bait, or using a sea fishing rod at the lake. Your hook needs to be at the right height and moving in the right way, this means getting the right sinkers and the right weights. There are plenty of guides and experienced people who can guide you on this. To attach a sinker or weight, tie a knot as described above in the eyelet available. It’s as simple as that. Make sure there’s enough line to tie the knot properly, so leave a bit more than you might have thought. Using a bobber is something you’re going to have to master, so attaching it right is key. Some use spring-loaded hooks to attach to the line, others are slip lines and need to be threaded before the hook and weights go on. Spring tipped bobbers have hooks at either end and can be tied in a specific place on your line. Make sure everything is screwed in tight. If it isn’t it could lead to your rod pinging off into the water, never to be seen again. Clean everything before and after you go fishing, it’ll improve the life of your gear enormously. Use the right strength line for the task at hand and don’t set your drag too high or it’ll snap really easily. Familiarize yourself with your gear before using it in a real situation. This means getting your cast right, knowing how the drag feels and how the line will spool out with something attached. If you’re familiar before you start, there will be less (expensive) surprises for you. Talk to more experienced fishers, they’ll be full of good advice. Ignore 50% of it and you’ll be fine. We hope you’ve enjoyed our guide on how to set up a fishing pole. We wish you the best of luck in your quest for the trout or the adventures you’ll have in saltwater, lake or sea fishing, it’s all out there for you to enjoy!